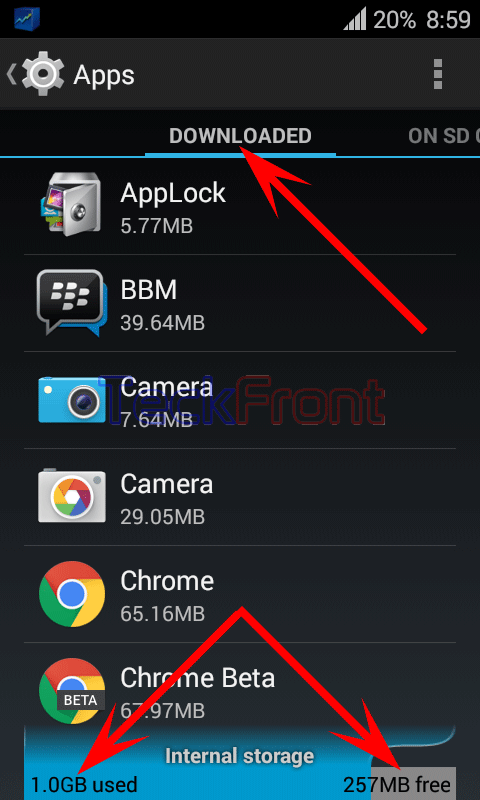 How to See Total Used & Free Internal Storage for Downloaded Apps in Android 4.4.4 KitKat Devices? Need to review the downloaded apps in your Android 4.4.4 KitKat device is felt when you are willing to download some apps from the Google Play store. It is a better to keep a constant eye on the total used and/or free internal storage space, left in your Android phone. It is time to decide about the fate of the downloaded apps in your Android phone, i.e. whether to get more space for new apps or not. To check the used and free internal storage space for downloaded apps in your Android device is an easy step if instructions are followed. Command Line: Settings > Apps – DEVICE > Apps Scree. 1: Follow the Command Line to open up the ‘Apps’ screen. See the DOWNLOADED apps at the extreme left of the screen. Now it is time to decide to download more apps or to uninstall some of the unnecessary apps to get more free internal storage. Newer How to Move Downloaded Apps from Internal Storage to SD Card in Android 4.4.4 KitKat Device? Older How to Show Wi-Fi Usage on Your Android 4.4.4 KitKat Device?